Home / How aeExchange works? 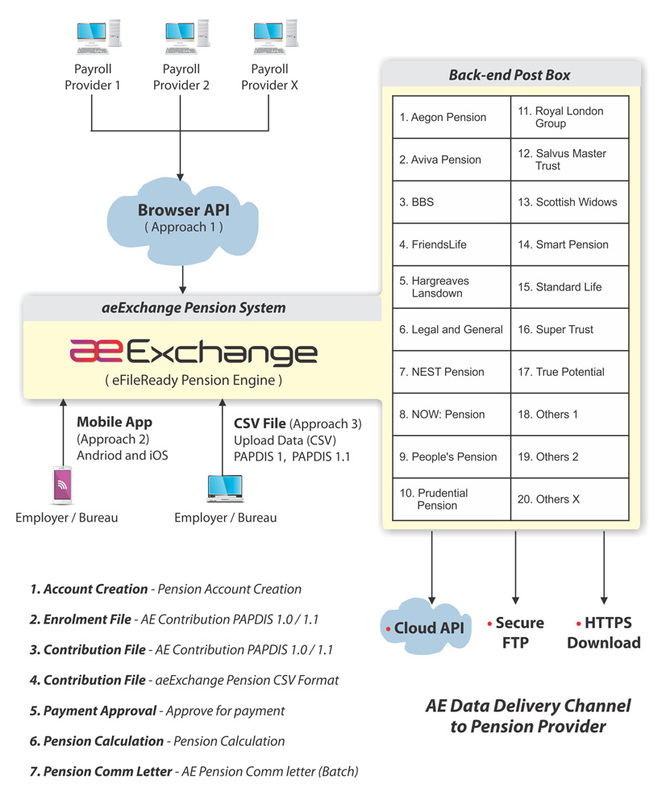 www.aeExchange.com aims to help payroll bureaus, employers and pension providers to transmit their AE data and conduct AE functions much more simply and efficiently. It allows payroll bureaus and employers to submit their AE data in batch, then, after the data has gone through a process of validation and conversion, pension providers can accept the submitted AE data in batch. You are able to submit a batch file in a CSV format containing the AE data for up to 2 thousand different clients which is destined for different pension providers. The system will accept such a file and in turn process each client in the file sequentially. The processed data will be split and stored in our database in accordance with your instructions and passed on to the respective pension providers over the https or in a CSV format. This will save you from processing your clients one at a time. aeExchange will validate your incoming data to ensure it is fully compliant. Alerts will be shown if your data does not comply with the respective pension provider's required standard or TPR standard. e.g. if you have a file for NEST and include an employee who has zero contribution without also providing NEST's required reason, we will alert you accordingly. The system will produce Enrolment files for new joiners for the various pension providers that require this. After your data has passed our validation tests an AE contribution file will be produced in the format required by various pension providers. The system is equipped to handle multi-channel and 2 way transactions between you and the pension providers. Certain pension providers, such as NEST, will provide a payment file for you to approve. This file again is provided in batch for you to confirm in batch efficiently. For those who need AE assessments or re-assessments to be done at the end of each pay period, the system will provide this service without fail. You simply need to indicate in the file to us that you need assessment services and we will do this accordingly. This is the most innovative solution of all. You need never again miss a single Comm letter. You can see all the Comms letters in batch, period by period, and print and/or email them as many times as you wish to respective employers or employees in batch. The Comms letters are constructed in accordance with TPR's standards. For those pension providers who have made their API available, the data will go straight to them with proof of submission. For those pension providers who are yet to provide an API, the AE contribution data will be stored in our post box in accordance with the respective pension provider's standards. Pension providers can then download the CSV files from our post box in batch sequentially every day, or at an agreed interval. The system also provides comprehensive contribution reports, period by period, in addition to comprehensive Comms letters. Many useful consolidated reports are also provided.